Al Diwaniyah (Arabic: الديوانية‎ Ad Dīwānīyah), also spelt Diwaniya, is the capital city of Iraq's Al-Qādisiyyah Governorate. In 2002 the population was estimated at 440,927. The area around Al Diwaniyah, which is well irrigated from the nearby Euphrates river, is often considered to be one on the most fertile parts of Iraq, and is heavily cultivated. The town is located on the main rail transport corridor between Baghdad and Basra. For birdwatchers, Al-Diwaniyah is a city with a rich bird list, as the city has a wide range of biodiversity. Al-Qadisiyah consists of vast agricultural areas, wetlands, arid zones, and semi-desert areas. The city is the site of a tire manufacturing plant that once provided tires for much of Iraq. The plant is currently active. Al-Diwaniyah is the headquarters of the Iraqi Army's 8th Division (Iraq). Al Diwaniyah has a hot desert climate (BWh) in the Köppen–Geiger climate classification system. ^ Gordon, Michael (2008-08-03). "The Last Battle". New York Times. Retrieved 2008-08-04. 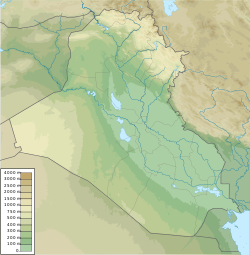 ^ "Climate: Ad Diwaniyah, Iraq". Climate-Data.org. This page is based on the Wikipedia article Al Diwaniyah; it is used under the Creative Commons Attribution-ShareAlike 3.0 Unported License (CC-BY-SA). You may redistribute it, verbatim or modified, providing that you comply with the terms of the CC-BY-SA.